The city has obtained a reputation as one of the most bicycle friendly in the nation. But that doesn&apos;t mean you can do just anything on a bike in Madison. Riding on a sidewalk crowded with pedestrians, for example, is a no no. 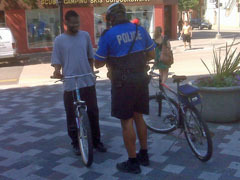 Jones and another officer were working State Street on bikes Wednesday, while two others worked from their squad cars. The effort was not one sided: earlier in the week, officers focused on making sure drivers were obeying the laws regarding cyclists and pedestrians.